The original SPAD company had been the Société Anonyme Pour les Appareils Deperdussin created in 1910 by Armand Deperdussin, who was later arrested for embezzlement. In August 1914 the bankrupt SPAD company was taken over by Louis Blériot, who was anxious to retain the well known SPAD acronym but sought to distance the revised company from its disgraced founder by altering its full name to the Société Anonyme Pour l’Aviation et ses Dérivés. Fortunately for Blériot, together with the company he secured the services of Louis Béchereau, its chief designer and a man whose great capability had been responsible for Deperdussin monoplanes winning both the Gordon Bennett landplane and Schneider seaplane races of 1913. As the designer of aircraft notable mainly for their speed, it was almost inevitable that after the start of World War I Béchereau should turn his attentions to the design of fighters rather than any other type of warplane, and in this he was greatly encouraged by the emergence during 1915 of a new and potentially decisive engine, namely the Hispano-Suiza 8 water-cooled V-8 unit designed by an expatriate Swiss engineer, Marc Birkigt: this engine was a water-cooled unit with monobloc cast aluminium cylinder blocks, and for a weight of 445 lb (202 kg) with coolant water delivered 150 hp (112 kW) with the promise of considerably more power in its fully developed versions. The new engine’s combination of high power output and low power/weight ratio was attractive to the designers of all types of warplane, but especially to the creators of fighters. Béchereau was no exception as he, like most British and German fighter designers of the period, had come to the conclusion that the air-cooled rotary piston engine was approaching the end of its useful life as a fighter powerplant as a result of its increasingly high centrifugal and gyroscopic forces. The Germans were the first to come to grips with the implications of the air-cooled rotary engine’s inherent limitations and switched in the early part of 1916 to the water-cooled inline engine, typically the Mercedes D.III and Benz Bz.III six-cylinder inline units rated at 160 and 150 hp (119 and 112 kW) respectively, for fighters such as the Albatros D I and D II that were instrumental in winning air superiority back from the French rotary-engined fighters such as the Nieuport Nie.11 and Nie.17 in the period from August 1916. The French were only just behind the Germans, however, and the more capable S.7, which received the company designation S.VII and was flown in the C.1 (Chasse mono-place, or single-seat fighter) category, soon restored air superiority over the Western Front to the Allies. Like the slightly later Royal Aircraft Factory S.E.5, the S.VII resulted from the availability of the Hispano-Suiza 8A engine in its original form with direct drive of the propeller and a rating of 150 hp (112 kW), and both aircraft then evolved one step further with the introduction of the Hispano-Suiza 8B engine with geared propeller drive and a rating of 200 hp (149 kW) or more. The introduction of the uprated engine turned the S.E.5 into the superlative S.E.5a, generally fitted with the Wolseley W.4A Viper engine that was a British development of the Hispano-Suiza 8A with a higher compression ratio for greater power and, in order to overcome initial problems with the French engine’s reduction gearing, direct drive of the propeller. Birkigt was then able to eliminate some of the problems associated with the gearing, although continued difficulties resulted from poor manufacture, and Béchereau therefore used the standard Hispano-Suiza 8B engine to create the S.13, or S.XIII as it was known to the company, out of the S.7. The first S.13 therefore flew on 4 April 1917 as a development of the S.7 with a basically similar layout but of slightly larger overall size and based on a new structure, the uprated powerplant of one Hispano-Suiza 8Ba engine rated at 200 hp (149 kW), a number of aerodynamic improvements (including longer-chord ailerons on the upper wing and a more rounded horizontal tail surface) to enhance controllability and manoeuvrability, and the heavier fixed forward-firing armament of two 0.303 in (7.7 mm) Vickers fixed forward-firing machine guns in place of the S.7’s single such weapon. 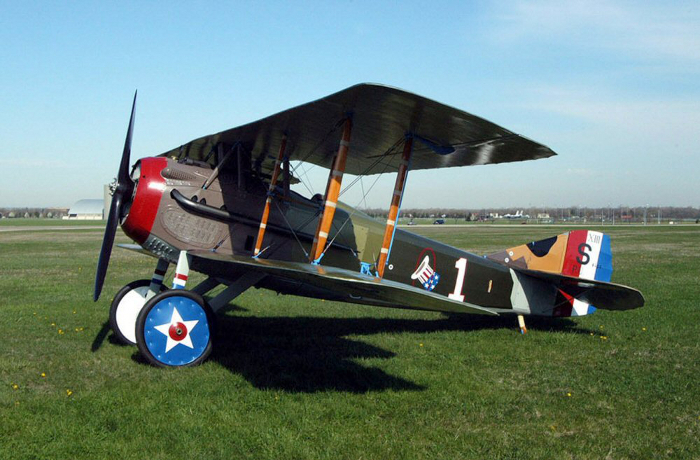 The S.13 was thus a slightly unequal-span biplane of wooden construction covered largely with fabric. The core of the structure was the fuselage, which was based on a rectangular-section framework of internally wire-braced longerons separated by three metal bulkheads and spacers, and to this were added rounded upper and lower deckings. From front to rear, this fuselage carried the powerplant, fuel and oil tanks, open cockpit for the pilot, and tail unit. This last comprised single horizontal and vertical surfaces, the former including a tailplane braced to the lower longeron on each side by a single strut and carrying plain elevators, and the latter including a wire-braced triangular fin carrying a plain rudder that was hinged at its lower end to the vertical knife-edge in which the fuselage terminated. The only very slightly staggered wing cellule was based on essentially similar upper and lower wings of constant thickness and chord (greater on the upper wing than the lower wing) to their rounded tips, and inversely tapered ailerons were fitted on the outboard ends of only the upper wing’s trailing edge. The halves of the flat lower wing, each with a cut-out in the trailing edge of its root, extended from the lower longerons, while the one-piece flat upper wing had a large cut-out in the trailing edge of its centre section over the cockpit and was carried above the fuselage by an arrangement of four cabane struts. The upper and lower wings were separated on each side by a single set of parallel interplane struts, and the whole wing cellule was braced with the normal arrangement of flying and landing wires whose intersections were braced to the upper and lower wings on each side by half-struts that gave the S.13 the appearance of a two-bay biplane. The airframe was completed by the landing gear, which was of the fixed tailskid type with a main unit of the spreader-bar type based on two wire-braced V-type struts extending downward and outward from the lower longerons with their closed ends connected by a spreader bar carrying short bungee-bound axles, each fitted with a single wheel, at their outboard ends. As noted above, the powerplant was based on one Hispano-Suiza 8B engine driving a two-blade wooden propeller of the tractor type: this engine was installed in the front of the fuselage inside a louvered light alloy cowling, that left only the cylinder heads exposed, drew its fuel from a gravity-feed tank that was located in the upper-wing centre section and drew of a main tank faired into the curved lines of the lower fuselage, discharged its spent gases via two long horizontal exhausts attached to the manifolds, and was cooled by a frontal radiator. Large-scale orders for the S.13 had been placed well before the type’s first flight, and the new fighter entered service in May 1917, initially somewhat tardily as production was slow to get under way, as the S.13C.1, though this was generally rendered as XIIIC.1 on the fin of service aircraft despite the fact that it was a mix of company and official elements. In its initial form with the Hispano-Suiza 8Ba, 8Bb or 8Bd engine rated at 200 hp (149 kW), the S.13 differed from the later production standard in its span of 27 ft 0.75 in (8.25 m) with an area of 227.23 sq ft (21.11 m²), empty weight of 1,246 lb (565 kg), maximum take-off weight of 1,808 lb (820 kg), maximum speed of 116 kt (133.5 mph; 215 km/h) at 6,560 ft (2000 m) declining to 109.5 kt (126 mph; 203 km/h) at 16,405 ft (5000 m), climb to 9,845 ft (3000 m) in 7 minutes 50 seconds, and endurance of 2 hours 0 minutes. From the beginning of its operational life the S.13 enjoyed success in the air combat role, even though the type was initially so bedevilled by reduction-gear reliability problems that the earlier S.7 had to remain in service right into 1918 to plug the operational gaps left by failed S.13 fighters. Engine problems apart, the S.13 was a fine warplane, and the only significant modifications effected in the airframe were the later change from rounded wing tips to square-cut tips with rounded off corners reducing span to 26 ft 6 in (8.08 m) and area to 217.44 sq ft (20.20 m ), and the introduction of an additional pair of cabane struts to support the leading edge of the upper-wing centre section. Additional power was also provided by the replacement of the original Hispano-Suiza 8Ba, 8Bb and 8Bd engines first with the Hispano-Suiza 8Bc rated at 220 hp (164 kW), then the Hispano-Suiza 8Be also rated at 220 hp (164 kW) but fitted with a supercharger for better performance at altitude, and finally the Hispano-Suiza 8Bec rated at 235 hp (175 kW). Very large orders were placed for the S.13, and deliveries from nine French manufacturers are said to have totalled 8,472 aircraft before the Armistice of November 1918 ended World War I, when outstanding contracts for some 10,000 more aircraft (including 6,000 to be built in the USA by Curtiss) were cancelled. Deliveries from the French manufacturing consortium up to the first part of 1919, when aircraft already under construction were completed, were said to have totalled 361 from ACM de Colombes, 1,750 from Bernard, 2,300 from Blériot, 300 from Borel, 1,280 from Kellner, 340 from Levasseur, 700 from Nieuport, 300 from SFCA, and 1,141 from SPAD: later reassessment of these figures indicates that the total of aircraft completed was more probably in the order of 7,300 machines. The vast majority of these aircraft were delivered to the French army air service, in which the S.13 eventually equipped 81 escadrilles de chasse (fighter squadrons). The type got off to a start that was unfortunate for French morale as it was in one of the first S.13 fighters that Capitaine Georges Marie Ludovic Jules Guynemer, victor over 54 German aircraft and without doubt France’s most popular ace of World War I, met his death while flying an S.13 in September 1917 in circumstances that had never been explained. The popularity of the S.13 in France was then assured, however, by its successful use by a number of other aces including Capitaine René Paul Fonck, the Allied ‘ace of aces’ with 75 victories, Lieutenant Charles Eugène Jules Marie Nungesser, third on the French ace list with 45 victories, and Capitaine Georges Félix Madon, fourth on the French ace list with 41 victories. Other notable French exponents of the S.13 were Lieutenant Michel Coiffard (34 victories), Capitaine Armand Pinsard (27 victories), Sous-Lieutenant Claude Marcel Haegelen (23 victories), and Capitaine Albert Deullin (20 victories). The consensus of French pilots was that the S.13 was a tricky aeroplane to fly, especially at low speeds when it had to be flown rather than floated onto the ground during landings, but was immensely strong and rewarded those who could handle the aeroplane effectively as an excellent and highly stable gun platform. The S.13 remained in French service up to 1923, and aircraft surplus to French requirements after World War I were sold to Belgium (37 machines), Czechoslovakia, Japan and Poland (40 machines). During World War I S.13 fighters were delivered to a number of French allies including Belgium, Italy, the UK and the USA. Belgium received a small number of aircraft for its 10e Escadrille, whose leading pilot was Sous-Lieutenant Edmond Thieffry with 10 victories. Italy received enough aircraft to equip 11 squadriglie da caccia (fighter squadrons) for service into the mid-1920s, and although Italian fighter pilots generally favoured the more nimble rotary-engined fighters as typified by the Hanriot HD.1, the S.13 was used to very good effect by pilots such as Maggiore Francesco Baracca, Italy’s leading ace with a tally of 34 victories, Tenente-Colonnello Pier Ruggiero Piccio, third-ranking Italian ace with 24 victories, and Capitano Fulco Ruffo di Calabria, fifth-ranking Italian ace with 20 victories. The UK received 54 aircraft, and these machines equipped Nos 19 and 23 Squadrons on the Western Front but failed to achieve notable results. The USA was the largest operator of the S.13 other than France, for the US Air Service received no fewer than 893 such aircraft after February 1918 for the use of 16 squadrons supporting the American Expeditionary Force in France. American aces who flew the S.13 included Captain Edward V. Rickenbacker, the top-ranking American ace with a total of 26 victories, 2d Lieutenant Frank Luke Jr. who was second on the American ace list with 21 victories, Major Raoul Lufberry who was third on the American ace list with 17 victories, Captain Jacques Michael Swaab who was ninth on the American list with 10 victories, 2d Lieutenant Clinton Jones with eight victories, and 1st Lieutenant Leslie J. Rummel with seven victories. At the end of World War I most of the S.13 fighters surviving in France escaped the fate of most of the other American aircraft in this theatre, which were burned in the ‘billion dollar bonfire’, and 435 of them were shipped back to the USA for continued service as a first-line fighters. By the early 1920s, however, problems with the Hispano-Suiza 8 geared engine were becoming so acute that most of their aircraft were revised to S.13E standard as advanced flying and fighter trainers with the revised powerplant of one Wright-Hispano Type E water-cooled V-8 direct-drive engine rated at 180 hp (134 kW) for greater reliability but considerably lower outright performance. Built to the extent of only 20 aircraft for service from June 1918, the S.17C.1 from June 1918 was a strengthened development of the S.13 with the powerplant of one Hispano-Suiza 8F engine rated at 300 hp (224 kW), and was intended for the reconnaissance fighter role with operational equipment that included two reconnaissance cameras and one (reconnaissance role) or two (fighter role) examples of the 0.303 in (7.7 mm) Vickers fixed forward-firing machine gun. The S.17 was dimensionally identical with the late-production S.13 but had the smaller wing area of 215.29 sq ft (20.00 m²), but otherwise differed in details such as its empty weight of 1,515 lb (687 kg), maximum take-off weight of 2,077 lb (942 kg), maximum speed of 117 kt (135 mph; 217 km/h) at 6,560 ft (2000 m) declining to 108.5 kt (125 mph; 201 km/h) at 16,405 ft (5000 m), climb to 13,125 ft (4000 m) in 12 minutes 32 seconds, service ceiling of 23,540 ft (7175 m), and endurance of 1 hour 15 minutes. Very similar in many respects to the contemporary S.17, the S.21 had basically the same fuselage, fixed forward-firing armament, Hispano-Suiza 8Fb engine rated at 300 hp (224 kW), tail unit and landing gear in combination with a revised wing cellule. This was of the equal-span type with long wings that had ailerons on the outboard ends of both the upper and lower wings’ trailing edges rather than just those of the upper wing as on the S.17. Evaluation of the S.21 ended in October 1918, when the programme was terminated as being irrelevant to France’s requirements as World War I was almost over, though the two prototypes were retained for experimental work. The S.21’s data included a span of 27 ft 7.25 in (8.44 m) with area of 253.00 sq ft (23.50 m²), length of 21 ft 0 in (6.40 m), height of 7 ft 11 in (2.42 m), maximum speed of 119 kt (137 mph; 221 km/h) at 6,560 ft (2000 m), climb to 6,560 ft (2000 m) in 5 minutes 40 seconds, and endurance of 1 hours 40 minutes. A type whose development was abandoned early in 1919 after evaluation of the prototype, which was incomplete two weeks after the Armistice that ended World War I, the S.22 was basically the S.17 with a completely revised wing cellule. Probably developed by Béchereau, presumably by arrangement with his new employer after the designer’s departure from SPAD in the spring of 1917, the S.22 reflected the growing dissatisfaction expressed by service pilots with the fields of view from the cockpit of the S.7 and its direct successors: the lower wing was therefore of inverse taper, and its halves, which were attached to the fuselage much farther to the rear, were swept forward, while the upper wing was swept sharply backward from a centreline junction of its two panels immediately above the upper lip of the engine cowling, and carried inversely tapered ailerons on the outboard ends of its trailing edges. This wing cellule was of the two-bay type, the two inboard struts being of an eccentric H-type arrangement with auxiliary elements above and below the fore-and-aft longitudinal crossbar. The data for the S.22, which was powered by the Hispano-Suiza 8Fb engine rated at 300 hp (224 kW), included a span of 26 ft 6.125 in (8.08 m) with area of 217.44 sq ft (20.20 m²), and length of 20 ft 6 in (6.25 m). Countries whose air arms operates the S.17 included Argentina (2), Belgium (37+), Brazil (not available), Czechoslovakia (not available), France (fewer than 7,345), Greece (not available), Italy (not available), Japan (not available), Poland (40), Russia (not available), Siam (not available), Spain (not available), Turkey (not available), UK (54), Uruguay (not available) and USA (893). SPAD XIII rear fuselage are. They appear to be metal and are just forward of the horizontal stabilizer. I would be most appreciative, if you can enlighten me.